In the late winter of 2014, Joe Wood invited me to attend Lake Tahoe CUE Rock Star Camp as a faculty member. Around that same time, Joe and I completed our Chief Technology Mentor program with CETPA and had just received our award letters. I was preparing to transition from a position in West Contra Costa Unified School District as a Business Specialist on special assignment and begin a new position that January with Dublin Unified School District as their first-ever Chief Technology Officer. I accepted and felt like “Why not jump in and attempt to do something new?” I have been delivering professional development for corporations and school districts for the last 17 years. I have written curriculum, designed interfaces, and have trained staff on a variety of topics related to technology. I spent approximately 4 to 5 months researching, refining and preparing what would become a few slides and a slide deck and one document per day on topics that I chose. More important than my getting to choose my own topics to present was the opportunity I created for my 10-year-old son and I to co-teach on a topic that we are both very passionate about: coding. He created three math Scratch projects that we would deliver together in our sessions on day two. As CUE Rock Star Lake Tahoe came closer, my son and I both found ourselves excited and nervous at the same time. We arrived in Lake Tahoe in the summer of 2015 on a Sunday afternoon and attended a barbecue for Rock Star faculty. At the barbecue, Bryce instantly made friends with some of the adults who were my peers and who would be presenting with me for the next several days. I knew instantly that we had made a great choice together! The topics I covered over the three days are below and you can see all of our resources and projects. What I most enjoyed about the experience was the time with my son in an environment where he could see what mommy does every day at her job. When we were not in sessions together, we were exploring other classes, playing with many of Brian Briggs’ robotic toys, and enjoying being around other Rock Stars! In addition to the content delivery, the relationship building and the time just enjoying conversation together, my son and I also made many new friends. The value of an intimate professional development opportunity like a CUE Rock Star Camp is hard to quantify. I observed teachers walking through the door the very first morning, apologizing for their lack of knowledge. That is a very common thread seen by those of us delivering educational technology. I will tell you those same teachers were tweeting about new hurdles they had overcome and mastered within a number of hours as takeaways. It takes great bravery to walk into a training opportunity that you have personally selected with no prior knowledge. For many of us in district leadership across California, and I will assume many other states in the country, professional development is a very hot topic right now related to technology integration. I highly recommend CUE Rock Star camps for not only the experience of leading sessions, but also for the opportunity to attend sessions with professionals who believe that technology engages students and makes learning fun. Once I got back to my district, I met with my superintendent and briefed him on my experience as a Rock Star faculty member. I shared with him the approach to professional development, the relaxed manner in which interactions occurred, the high level of engagement of the all of the teachers participating, and the takeaways that they felt they would be able apply once they were back in their classrooms in the fall. My superintendent also has delivered professional development for many years, and found this model to be very intriguing. I am hopeful that as we move through the school year together, we can find places where our professional development and department and or staff meetings can look much like the format of CUE Rock Star. 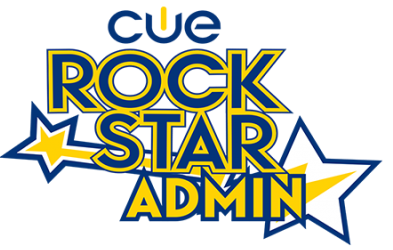 I am lucky to be able to present again for CUE Rock Star Admin at Skywalker Ranch in November 2015. My son won’t be teaching with me this time around, but I look forward to taking back as much learning as I can to share with him and my district.